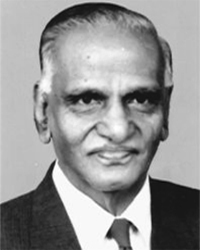 Dr. Krishnamurthi was born in 1919 to Sundara Reddy and Muthulakshmi Reddy, India's first woman medical graduate. He passed MBBS in 1942 and M.S. in 1946. In 1947, he went abroad to work as a Fellow of the Ellis Fischel State Cancer Hospital, Missouri, U.S., and later, at the Royal Cancer Hospital, London. Right through, he immersed himself in oncology, an interest that was to dictate the rest of his life. On returning to India, Dr. Krishnamurthi took charge as head of the Cancer Unit, Government General Hospital here. His close associate and collaborator of many years, V. Shanta, Director, Cancer Institute, recalled in an interview to Frontline in August 2005, how Dr. Krishnamurthi tried to kill corruption that was rampant in the hospital at that time. It is said that his interest in the causes and treatment of cancer was kindled by his mother. Muthulakshmi Reddy started the Adyar Cancer Institute as a four-bed unit in 1954, and Dr. Krishnamurthy became her natural heir there. He took over as Director in 1959 and the Institute has grown to 450 beds now. He and Dr. Shanta were the only doctors on call at the Institute in the initial years when treatment of cancer in India was in its infancy. For Dr. Krishnamurthi, working to eradicate cancer was his life's purpose and he devoted all his time and energy to this mission. He advocated the idea that it was important to detect cancer in the initial stages in order to be able to cure it. In 1970, the government recognised his pioneering efforts towards understanding and treatment of cancer and awarded him the Padma Shri. From 1965, he was on one or more committees of the World Health Organisation up until 1982. In 1983, he became a member of the Advisory Committee on Cancer Control and Planning of the Central government. He was also a much sought-after expert in his field. DR. S. KRISHNAMURTHI: In a nation that does not have too many purposeful institution-builders, the significance of his life and work becomes evident through a brief chronicle of the Cancer Institute. Just over a month ago at the Cancer Institute at Adyar in Chennai, this writer was sitting by the bedside of the ailing Dr. S. Krishnamurthi, recording a long interview with him. He spoke haltingly and in a low voice, but with perfect command over his thoughts. Winding up, he said: "Yes, I'm contented with my life, I've lived not for myself but for others. No, I'm not satisfied with what we've achieved at the Cancer Institute. There's more to be done. But I've no regrets." It was the voice and tone of a pioneer who had, with a sense of mission, struggled hard and long to build an institution and was now grappling with a vastly different environment. Dr. Krishnamurthi passed away on July 2, 2010. He was closely associated with the Cancer Institute. In a nation that does not have too many quality institutions of its kind or purposeful institution-builders, the significance of his life and work becomes evident through a brief chronicle of the Cancer Institute. The force behind the establishment of the Cancer Institute was Dr. S. Muthulakshmi Reddy, the social reformer and legislator. But by the time it started functioning in 1954, she was aged and ailing. It was her son, Dr. Krishnamurthi, who spearheaded its growth and gave it thrust and direction, together with Dr. V. Shanta, who joined the Institute soon after its inception. With a team of dedicated doctors, they built up the Institute as a model of comprehensive care, technological excellence and outreach for the poor. It has become synonymous with the names and personalities of Dr. Krishnamurthi and Dr. Shanta. The Cancer Institute has many achievements to its credit. It was the first medical institution in South India exclusively devoted to cancer treatment. Moreover, it was a comprehensive institution, being a centre for research, teaching and prevention, and advocacy. Structured as a private trust and working on the principle of non-profit voluntarism, it struggled to mobilise funds through donations and government grants, acquire land and buildings. Even after so many years, the memory of his battles with ignorance, apathy and bureaucratic corruption made Dr. Krishnamurthi bristle with anger in his hospital-bed. Periodically, the Institute acquired advanced technology and cutting-edge equipment to keep its vanguard position. It set up protocols for treatment which are considered to be landmarks in cancer treatment. To give one example, it pioneered the multimodal approach in which medical, surgical and radiation oncology were all given their due place, and the protocol for a case was developed by a multi-specialty team. The protocol developed for case notes ensured that follow-up was a team exercise, not pegged exclusively on an individual doctor. Collectively, over five and a half decades and across thousands of cases, a finely honed institutional memory was generated which all doctors could draw upon. At the crux of its founding philosophy was a commitment to make treatment and care accessible to the poor. The abiding principle was that a patient with curable cancer should not be denied treatment for lack of money. Currently, up to 60 per cent of the patients receive free or highly subsidised treatment. For all these reasons, it was, and is, a unique institution. It has trained and nurtured many young doctors: they have fanned out all over the country and abroad. From its inception the Institute embodied the Nehruvian spirit of progress and national development. But the culture of the Institute goes back to a much earlier source. In the 1920s, Dr. Muthulakshmi Reddy, amidst her energetic and fiery campaigns for the emancipation of women and girls, and the abolition of the Devadasi system, started her quest to set up a separate cancer hospital, having lost her young sister to cancer. At a time when cancer was considered to be a karma vyadhi, inescapably fatal, she battled on for three decades to persuade people that cancer was curable. What was needed was timely and specialised treatment. She did this under the umbrella of the Women's Indian Association (a branch of the All India Women's Conference) of which she was the 'Chairwoman'. Thus the same impulses that fired her engagement with social reform, nationalism and in some ways, Gandhian philosophy, pervaded her endeavours in institutionalising cancer treatment. This is the legacy that Dr. Krishnamurthi inherited and expanded on. His devotion to his mother and her ideals shone throughout his conversation. He went to the United States for specialised training in oncology and found a job in the Royal Cancer Hospital London. When he wrote to his mother about the move, he received a telegram that she was seriously ill. He returned immediately - to find her hale and hearty. She said: "I sent you abroad to study so that you could come back and serve our people, not live comfortably in a foreign country." Dr. Krishnamurthi gave a slight smile at this memory. The style and culture of the Institute have been shaped the values of simplicity, austerity, hard work with a service orientation, belief in science as the harbinger of progress, commitment to national development not motivated by monetary rewards. Dr. Krishnamurthi embodied all this in a personal way. That hot morning in late May, both of us were sweating while conversing, but he courteously told me that he would switch on the air-conditioner at 12 noon and switch it off at 4 p.m. That was the discipline he had set for himself. Healthcare in India has been transformed in recent years. Apart from the voluntary and government sectors, and small, family-run nursing homes, the rise of corporate health care institutions based on business models has created tremendous opportunities for some, and inequalities of access for many. New objectives, salaries and ethos have led to a devaluation of voluntarism. Even religious trusts with enormous funding from foreign devotees are now inclined in this direction. The internal structure of voluntary non-profit institutions led by a few charismatic individuals have not yet successfully adapted to this situation. The Cancer Institute has been facing a severe problem of young doctors leaving it within a few years of joining. Market salaries for super-specialties like oncology are extremely high, and till recently the Institute's pay scales were embarrassingly low. Private practice is not permitted. The workload on the doctors is heavy, leaving little time for research. A doctor may sometimes see 170 patients in a day. Emphasis on close monitoring of institutional ideals comes in the way of the autonomy needed for motivating talent and spurring innovation. Cancer demands complex tertiary treatment with huge financial investments and the Institute needs to upscale its functioning. It has a single location - Chennai - but draws patients from rural Tamil Nadu, Andhra Pradesh and Orissa. The sheer volume of patients slows down delivery and inhibits innovations tailored to the individual's need. Rather than cater to all stages of treatment and levels of seriousness of cases, it may need to limit itself to advanced cases and create capabilities in smaller units in other cities and towns. In his last years, Dr. Krishnamurthi along with Dr. Shanta and others was engaged in an internal institutional debate on these issues. A proactive Governing Council had started initiating changes while keeping the original spirit intact. Institutions, like rebellious sons of overwhelming fathers, have to come into their own, in order to re-energise the old ideals and imbue them with relevance in new circumstances. Till his last breath, Dr. Krishnamurthi was alive to the complexities of nurturing and passing on a precious legacy. It is customary to outline the bio data of the person in whose memory the oration is being delivered. The audience here today, the staff of the Cancer Institute (WIA), alumni, colleagues, friends, Dr.Ian Magrath, none of them need any introduction to Dr.Krishnamurthi. I have had the unique pleasure and privilege of working closely with Dr.Krishnamurthi from 1950. I first met him in the newly opened cancer OP in the Government General Hospital in 1949as a final year medical student and then as a House Surgeon in the cancer ward in 1950, my first posting as House Surgeon. From 1950 to 2010 (almost 60 years). It will be virtually impossible to narrate details of human values and principles that Dr.Krishnamurthi believed in and practiced during my long association with him in 10-15 minutes. I shall attempt to do justice to his memory by narrating few incidents and quotes, a few of the observations he had made at different periods of our arduous journey. Dr V.Shanta, Chairman, Cancer Institute (WIA).